An instrument to measure the power and cylindric axis of a spectacle lens. 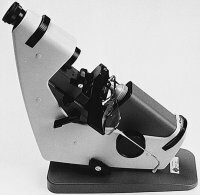 An optical instrument for determining the vertex power, axis direction and optical centre of an ophthalmic lens (Fig. F8). The instrument can be either manual or automated. Syn. Lensometer (a tradename); vertexometer; Vertometer (a tradename). See lens measure; neutralization; back vertex power.